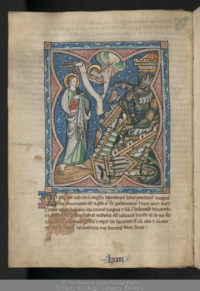 The Dublin Apocalypse, a 14th century illuminated manuscript of the Book of Revelation, is one of the greatest medieval treasures in the collection of Trinity College Dublin. It is also one of the least seen. Now the whole world can see it in high resolution thanks to a digitization initiative. 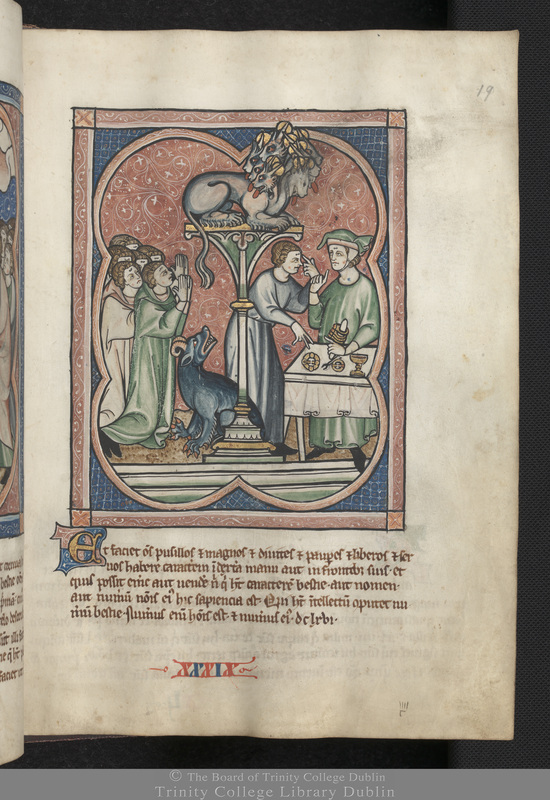 In medieval Europe illuminated manuscripts containing the Book of Revelation were hugely popular among royalty and the wealthy elite. These devotional aids were designed to help the faithful understand one of the most dramatic and difficult Christian texts. The beautiful Dublin Apocalypse manuscript represents one of the most lavish examples of this tradition and is among the finest illuminated volumes in the Library of Trinity College Dublin. 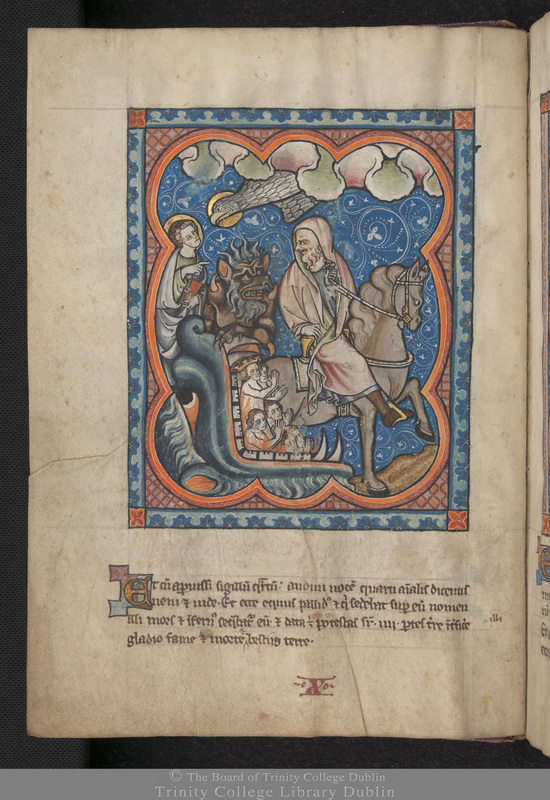 The 14th-century Latin manuscript of the Book of Revelation is accompanied by exquisite illustrations in gold and vivid colours and depicts scenes of the horsemen of the Apocalypse, battles with many-headed beasts and the heavenly Jerusalem for its readers to enjoy. The Dublin Apocalypse was produced in East Anglia in the early 1300s, likely by an illuminator known as the Ormesby Master. His highly individual style is characterized by intricate geometries in the borders, backgrounds and architectural features, complex compositions with remarkably soft flesh tones and a palette rich with pinks, blues, greens and greys applied in multiple layers of translucent washes. The illuminations in the Dublin Apocalypse are particularly stellar examples of his talents because unlike other Apocalypses of the period which have half-page illustrations, the Dublin manuscript’s illuminations take up almost the entire page. Most of its history is unknown. Sometime in the early 19th century it was acquired by Franc Sadleir, Triny College fellow, professor and librarian, and he gave it to the university in 1837 in exchange for a bunch of uncatalogued annuals. A rather unbalanced deal, it would seem, but de gustibus non est disputandum and all that. Anyway his loss is our gain. Peruse the digitized Dublin Apocalypse here. 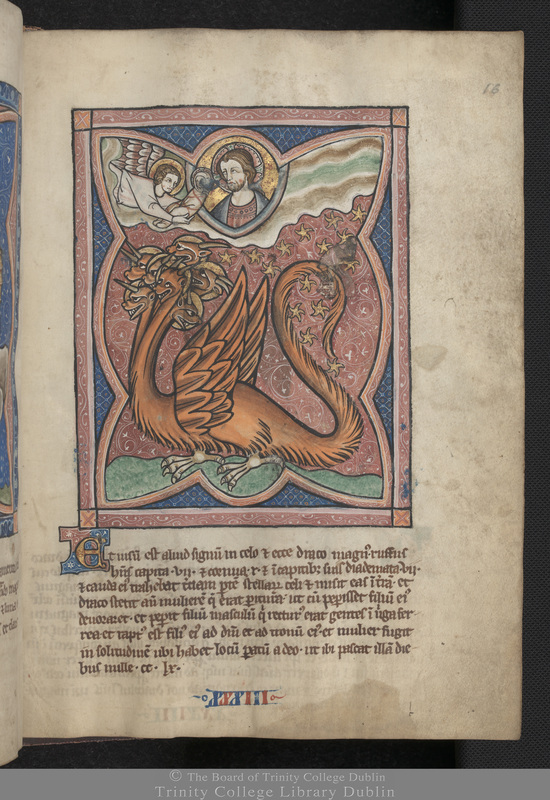 You can leaf through the manuscript page by page, using the viewer to zoom in on the details, or you can open each page as a jpg and examine the whole thing at maximum resolution. There’s also an open as pdf function, but I got an error when I attempted to use it. In the upper left is a “Click for more information” link which explains the scene and verses of Revelation it depicts. The scans are wonderfully high in resolution so you can dig deep into the intricate illuminations.